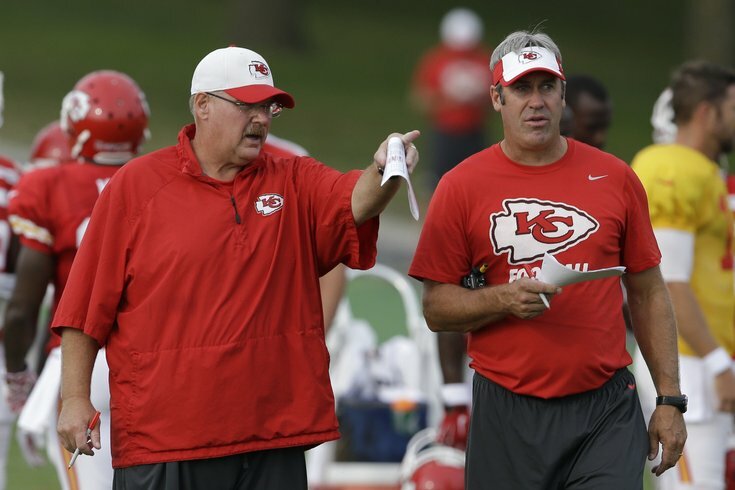 The coach that preceded Chip Kelly in Philly, Andy Reid, and the one that will replace him, Doug Pederson. The Eagles announced that they interviewed Doug Pederson today for their head coaching vacancy. It was widely reported that Pederson would be interviewing with the Birds after the Chiefs' wild-card round game, but their announcement makes it official that it has indeed happened. The Chiefs dismantled the Texans Saturday, 30-0, and will play the Patriots in New England next Saturday at 4:35 p.m.
Andy Reid was Pederson's quarterback coach when Pederson was a player in Green Bay in 1997 and 1998. When Reid landed the Eagles' head coaching job in 1999, he brought Pederson with him to be his temporary starting quarterback and mentor to rookie Donovan McNabb. After his retirement from playing in the NFL in 2004, Pederson became a high school football head coach, until Reid hired him in 2009 to be an offensive quality control coach for the Eagles. In 2011, he was promoted to be the quarterbacks coach. Over the last three years, the Chiefs' numbers are very consistent. They are a running team with overall unimpressive numbers, but they do a tremendous job limiting turnovers and allowing the strength of the team, the defense, to win games. That style of play could mesh well in Philadelphia. The Eagles clearly have more talent on the defensive side of the ball, but they have been put in an impossible situation over the last three years by Chip Kelly's unrelenting fast-paced offense. Since the Eagles and Chiefs changed over their coaching regimes in 2013, the Eagles have had the third most giveaways in the NFL. Over the last two seasons, they've turned it over more than anyone. Ideally, the Eagles' next head coach will recognize that the Eagles have far more talent on defense than they do on offense, and play accordingly. A ball-control approach would very likely be more effective than Chip Kelly's fast-paced nonsense that became stale in his third year in the league, and set up the defense for certain failure. Pederson may bring that. So if you squint hard enough, there's his appeal.